The Evanston Food Exchange highlights an exciting partnership of two community-building non-profits, directly reducing hunger and poverty in the North-Shore. Curt’s Café South has recently found it’s home in the 2nd ward of Evanston. #curtssouth provides workforce development skills to at-risk young women, many of whom are pregnant or parenting,. The second location to its’ flagship store, this non-profit/ for-purpose/ social enterprise provides job skills, social services, and a sense of community to the students they serve. In this operating business model, the young women learn the roles of a barista, a cook, a cashier, and a community citizen, all while participating in a 90-day curriculum focused on bridging opportunity gaps, connecting resources, and building confidence. 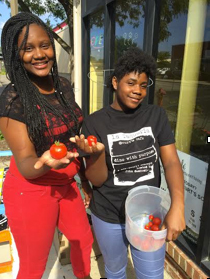 Within their first two months of programming #curtssouth partnered with The Yellow Tractor Project (TYTP), the non-profit arm of the corporate wellness agency, which provides health and urban agriculture education to the organizations they serve. TYTP paired with the local Girl Scouts and the students at South to install garden beds, where Curt’s would learn to grow and harvest fruits and vegetables with TYTP. 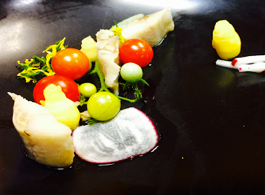 The students recently harvested hundreds of bright red cherry tomatoes and worked with the chef to create the beautiful meal pictured here. At South, the goal is not only for the students to learn to cook, but also to build creativity and think about the artistry in the food they make for their community. To recognize that everyone shares a need to eat brings a common denominator to even the greatest opposites. Realizing this can bridge the greatest gaps, as it can bring everyone to the table. As the Evanston Food Exchange highlights, we are “setting Evanston’s table” by bringing many groups together with mutual efforts of sharing food, conversation, and community building. All voices need to be heard at the table. A table with food that we can all share and enjoy. Food connects us, and the partnership between TYTP and Curt’s Café South reminds us just how powerful that connection may be. Bon Appetite!